Easter Egg hunt a great success! This years Honiton Swimming Club Easter Egg Hunt was held at Martin and Liz Bennets farm in Broadhembury. Although the weather had been appalling on the lead up to the event, the actual day was bathed in glorious sunshine with the added bonus of thick mud underfoot. With over 6 acres of land to hide the clues to the egg hunt, we expected our intrepid egg hunters to be out for some time. 40 Egg hunters aged from 6yrs – 45yrs trudged off into the distance to find the hidden egg clues. First back were Lucy and Janet in a record breaking time. I am sure they has a quad bike hidden away to get them around. With all safely back in just over an hour and a half we all tucked into some glorious burgers supplied by Complete Meats of Honiton. After being refreshed and saying hello to the Bennetts newly born calfs (oh and not forgetting Red the dog), the Egg Huntwers were presented with their well derserved easter eggs donated by Tescos of Honiton. The winner of the prize draw egg was lucky Christian Welford. A very big thank you goes out to Lizzy and Martin Bennet for letting Honiton Swimming Club use their land and facilities to make for a great team building day out. There will be an Easter Egg hunt for swimmers & guests at Lane End Farm, Broadhembury, on Saturday 27 March from 11am to 3pm. Food & drinks will be available for purchase e.g. BBQ burgers. Entry is only £2 per child/adult. RSVP to Lorraine Bugler, or drop an email to honitonswim@yahoo.co.uk, so we can plan for numbers. See you there! The final swim session before the half-term break is on Sunday 14 February. Swimming will resume on Thursday 25 February. If you have any more to add, please drop a line to honitonswim@yahoo.co.uk. Annual Presentation Night tomorrow, Friday 29 January! Starting at 7pm at Throgmorton Community Hall, Dunkeswell – come and support our swimmers! BYO drinks, some snacks provided. Now that we have your attention, can we please remind you to pay your club membership for the new year. Please see Tina Alam, 077 1771 3202, tinaalam@btinternet.com. Where applicable, term fees are also due for the Spring term. Thank you for your cooperation. P.S. Term dates for 2010 have now been posted on the Calendar tab. Owing to continuing snow & ice there are no swimming sessions this Thurs/Fri/Sunday 7/8/10 January. Happy New Year. After the holidays swimming sessions are now resuming again as normal (Thu/Fri/Sun), starting Thursday 7th January. See you there. 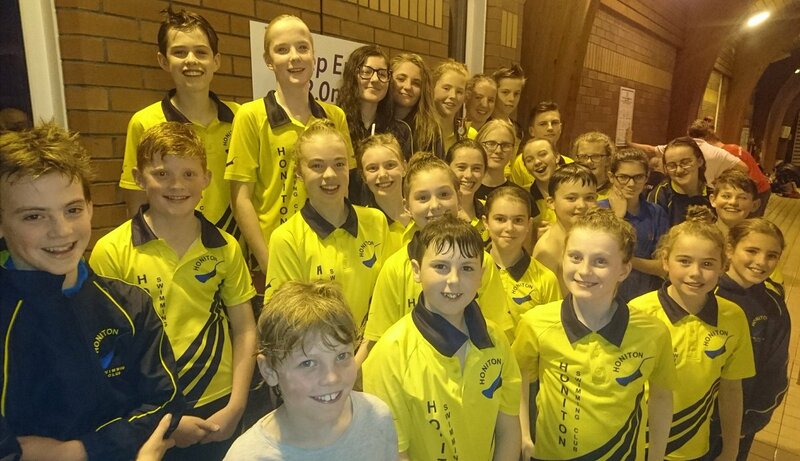 Honiton Swimming Club is the friendly place to swim in East Devon. If you are interested in swimming regularly please do get in touch. If you can swim front crawl, breast-stroke and backstroke with a reasonable amount of confidence, we welcome all abilities and ages. We have swimmers aged 8 to 60+. Many swim competitively, others just to keep fit. Well done to all swimmers at the Exmouth Christmas Cracker! Great swimming from everyone!